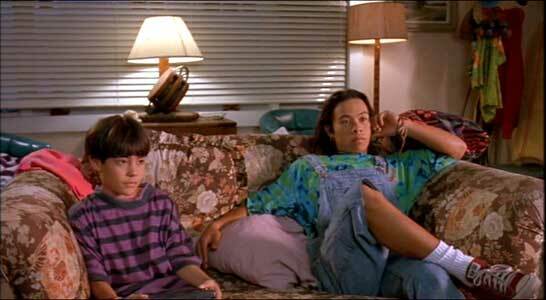 Eddie Reyes, Jr. and Rob Schneider wear red low cut Converse “Chuck Taylor” All Stars in the film. Johnny, Adam, and Iggy check out the town action. Leave your surfboard or skateboard against the wall and check your mind at the door. Surf Ninjas is another martial arts action/adventure/comedy that doesn’t require either. 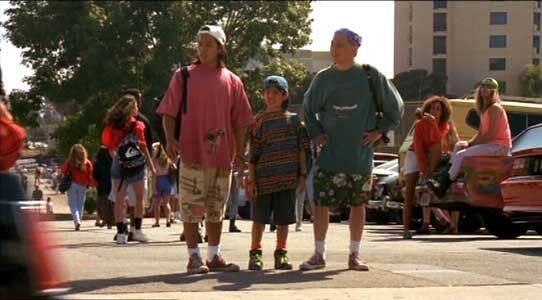 Designed to pick up when the Teenage Mutant Ninja Turtles and 3 Ninja series of films left off, Surf Ninjas takes us to the southern California beach town of Santa Monica, where we meet 15 year old Johnny (Eddie Reyes, Jr.) and 11 year old Adam (Nicolas Cowen) who live with their adopted father Mac (John Karlen). Johnny and Adam have been living lives of pleasant irresponsibility, trying to b.s. their way through school and spending most of their free time either surfing, skateboarding, or hanging out with their clueless but amiable friend Iggy (Rob Schneider). Although Mac tries to get them to be more serious about life and learn some useful skills, they would rather go motor-surfing than actually crack a book. But things are about to radically change in their lives. Adam and Johnny find out their true heritage. From almost the very opening scene, we see ninja attackers trying to get at the boys, but sucessfully fended off by Zatch (Eddie Reyes, Sr.) a mysterious ninja fighter with an eye patch. Gradually the attackers get bolder and eventually mount an all out assault on Mac’s hamburger stand and grab Mac. Zatch helps the three boys escape from the devastation and then tells Adam and Johnny that all of these events are part of their destiny. The two boys are actually the crown princes of a small south Pacific island kingdom named Patu San and Zatch has been their lifelong protector. When they were very young the island was taken over by a ruthless dictator Colonel Chi (Leslie Nielsen) and his mercenaries. Chi, who is campily played by Nielsen as a cross between Darth Vader and Dr. Strangelove, is trying to prevent a prophecy made years ago on the island that the older prince would come back on his sixteenth birthday and lead a popular uprising to free the island from Chi’s tyranny. The two boys don’t want to have anything to do with this prophecy, and tell Zatch that they would much rather remain in their surfer world. But when their house blows up, Zatch tells them that there is no turning back on their destiny and they must return to Patu San. But first they go to “little Patu San”, an area in Los Angeles where refugees from the island have gathered since Chi’s takeover. At the Imperial Palace they meet many loyal followers and Johnny discovers that he has been pledged in marriage to Ro-may (Kelly Hu). Later, the goons track the boys there and an elaborate fight goes on. During the fight Johnny suddenly has a revelation that he has the ability to fight ninja style and begins to participate in the action. But the main fighting action is still by Zatch. Zatch puts a chokehold on Johnny to see if he is ready to take on attackers. The boys now are buying into their “destiny” and get on a boat to Patu San, accompanied by Zatch, Lt. Spence (Ton Luc) a Santa Monica police detective looking out for them after the attacks, Ro-may and many one-liners. Once on the island, the brothers discover that they have inherited martial arts skills and an obligation to their people. Johnny must first prove himself by taking on Zatch. Later, when they are able to free some people from capture by the mercenaries of Col. Chi, they win the loyalty of the people and get the populace to rise up. The remainder of the movie is about what happens when the boys try to fulfill their destiny by taking on Col. Chi with their full-blown Surf Ninja invasion force and bring democracy back to the island, surfer-style. Johnny is attacked by two thugs at a local restaurant. Surf Ninjas is simple summer fun, full of jokes and jabs, the perfect kind of entertainment for one of Hollywood’s most prized markets, teenaged and twenty-something guys who want a blend of action and comedy. There are some well choreographed fight scenes with the Eddie Reyes senior and junior, but nothing ever gets too intense, or for that matter too believable. Nicolas Cowen gives a good performance as the younger brother who brings his knowledge of video games to help in their strategy. Kelly Hu as Johnny’s betrothed queen Ro-May provides us with a little romantic interest, but that never gets in the way of the action. Even though the plot is mindless, they film is enjoyable because it doesn’t take itself seriously. In fact the whole point of having Rob Schneider in the film is to provide instant satire for whatever event is going on. Zatch even says it in the film: “Who is he, someone you have around like a pet monkey or snake?” If you are looking for political messages or a discussion of freedom and repression in the world, look elsewhere. The whole story line is just a preposterous setup for a romp in the surfer world with a lot of action thrown in that is very engaging for its intended audience. So have some fun in the sun. Just don’t stay too long or your brain will get sunburned. 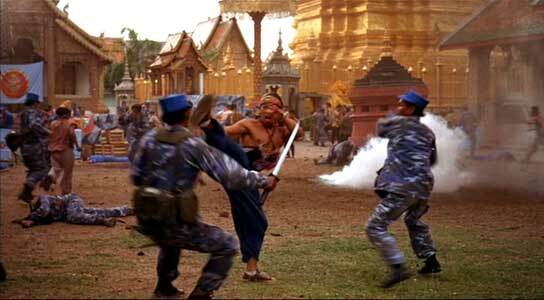 Johnny becomes a ninja warrior and leads the uprising against Colonel Chi’s forces. Johnny is able to avoid a huge spear thrown by Zatch. 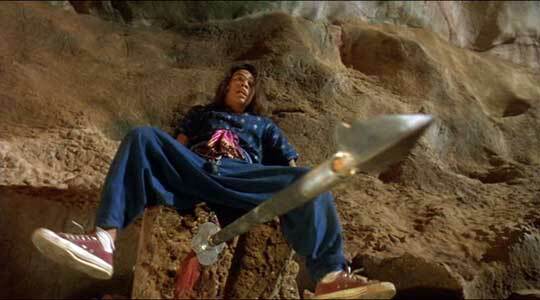 Surf Ninjas has a lot of good action footage. 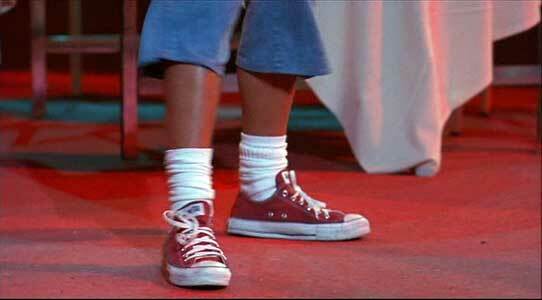 Both Eddie Reyes, Jr. and Rob Schneider wear red low cut chucks throughout the movie. They are especially striking in appearance during all of the action sequences where Reyes, in his role as Johnny, is learning to become a ninja fighter or when he takes on the bad guys. 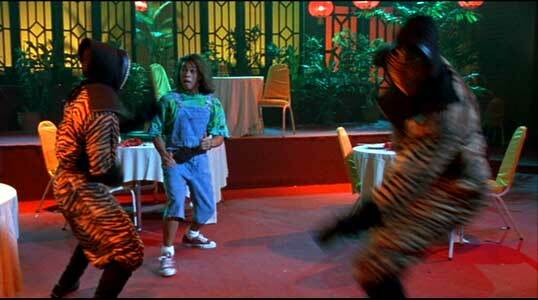 The best of these scenes is the fight at the restaurant, when Johnny is attacked by a group of thugs sent by Colonel Chi. Johnny gets ready to take on the thugs at the restaurant. Surf Ninjas. (1993) Ernie Reyes, Jr., Ernie Reyes, Sr., Nicolas Cowan, John Carlen, Rob Schneider, Leslie Neilsen. Directed by Neal Israel. Categories: Comedy, Action/Adventure.